We are so glad to offer you a brand new model of Fountaine Pajot coming to our luxury charter fleet in Greece. Named “NUMBER ONE” an Alegria 67 crewed catamaran already available for charter. Luxury crewed catamaran Alegria 67 “NUMBER ONE” for charter is the greatest charter sailing experience when coming with luxury on board with no compromises to comfort, performance and space. Fountaine Pajot’s flagship comes with all features that can be on the yacht, the branded French shipyard has done it self with Alegria 67. 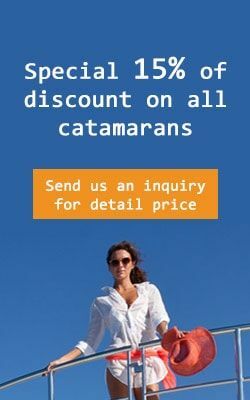 It can accommodate up to 8 guests this super-catamaran will offer you accommodation in one master and 4 double cabins. The large flybridge what is starching to the forward deck will offer you plenty of relax space for sunbathing and the cockpit area is amazing for eating and socializing. This 20m sailing catamaran is looking amazing, and its one of the most interesting design catamaran on the market. Its a first time a luxury crewed catamaran in Greece deserved the name “NUMBER ONE” and for a price that is amazing for this length catamaran. Charter catamaran Alegria 67 “NUMBER ONE” is ready to take you on a journey away through the islands of Greece. It can be chartered in all the Greece, form Cyclades, Ionians Sea, Saronic and the Dodecanese this beautiful Alegria 67 is available from all Greek island subject to availability the week before or after and with no extra fees to re-delivery. Charter one way from Athens to Santorini and Mykonos and leave the catamaran on the Santorini sunset. You can also rent it in Ionians from Corfu to Zakynthos. The catamaran is fully crewed all year long with the captain, hostess and chef will look forward to pampering guests on board without leaving any wish unfulfilled. Invite your family and friends on a one lifetime journey on Fountaine Pajot Alegria 67 “NUMBER ONE” luxury catamaran for charter. Advanced Provision Allowance (APA): 20-25% MYBA terms and conditions.